The Map of Joy 2009! This year I decided that we should make a list of all the trail centres we want to visit this year, and put them on a map. Because maps with pins in are awesome. The right hand side is reserved for souvenoirs. I’ve also left some space for more places to be added. Whoop! So, the weekend’s been and gone, and I’m crawling through another week of hard slog and overtime, waiting for…another demo day! This time it’s a Leisure Lakes demo day, and I’ll be trying out an Orange Diva and a Commencal Meta 5.5.2. Mr Toast is firmly rooting for the Meta. He has a Meta himself – the fact that it’s the only bike he’s bought in five years that hasn’t been sold or completely respecced beyond all recognition is a testament to how much he loves it. He’ll enthuse about it’s great spec for a good price – it weighs in at nearly a grand less than the Zesty. As for the Diva, I’ve always had a soft spot for Oranges (the bikes, not the fruit). I’m a bit worried that the new 5s have rather spindly looking top-tubes, but again, I guess I’ll see how it looks – and more importantly feels – on Sunday. If you’re a frequent biking visitor to the Chase and you’re not demoing bikes on Sunday, you could (and should) attend the ‘Big Dig Day’. The chaps at Chase Trails are hoping to get some more volunteers to help continue building Phase Two – the new red route. “Sunday 1st March – Big Build Day (Phase 2). Barbeque and prize draw for all volunteers. Be a part of our newest and most exciting trail so far. It’s only with your help that we’ll be able to get phase 2 ready and opened in 2009 so park up the bike for a day and pick up a shovel. Whilst we can provide tools we’re expecting a big turn out so bring you own spade, pick or sturdy rake. It’s a good way of making new friends, contributing to the trails, and getting involved in the community. And hell, there’s a barbecue! Nom nom nom! It was the second demo day of the year, and this one was the big one – the Bike Radar Demo Day. As I mentioned in a previous post, I’d booked a Lapierre Zesty 514L, a Santa Cruz Juliana, and a Yeti 575 – with a mind to demo a Trek Fuel 9 as well. First up was the Lapierre. Now, what I’m about to write is very difficult for me. You see, me and French engineering? We don’t go well together. I’ve never had a particularly high regard for it ever since my mate Dez bought a Peugeot, and had nothing but trouble with it. This view was reinforced when another friend bought a Renault…which was also plagued with problems. And, just to add a delicious layer of bitter icing to the cake of disgruntlement, I’ve had to fork out god knows how much money on my Nissan Micra. “But that’s Japanese!”, I hear you cry! Alas, dear reader, that’s also what I assumed. That’s why I bought it – because Japanese cars are traditionally very reliable. Which is why I was puzzled when I started having so many engine problems with my car over the past year – my car, incidentally, wasn’t even three years old when it started playing up. And recently, after having to replace the EGR valve, I learnt the source of my woes. Nissan Micras are Japanese designed…but the UK Micras with the current body shape (launched in 2003) have French engines. Renault engines, to be exact. So yeah, me and French engineering? Generally, I’d be screaming “NON!” right about now. 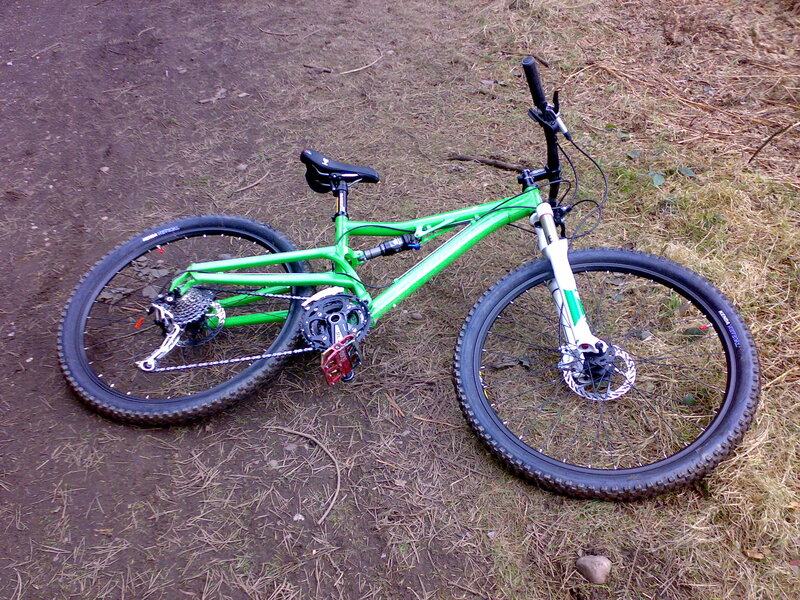 To ride, however, the Zesty 514 was the best bike I’ve ever ridden. It just felt…right. Solid, stable, but light and nimble. It inspired confidence on descents, and climbed nicely too. Everything was pretty much perfect – geometry suited me to a T, the brakes were set up with just the right amount of bite, and the gears were perfectly smooth. MMmmmm….Zesty! Unfortunately, the women’s version of the Zesty only seems to be available in the 514, not the slightly lower specced 314…which means it tips in at a mighty £2399. 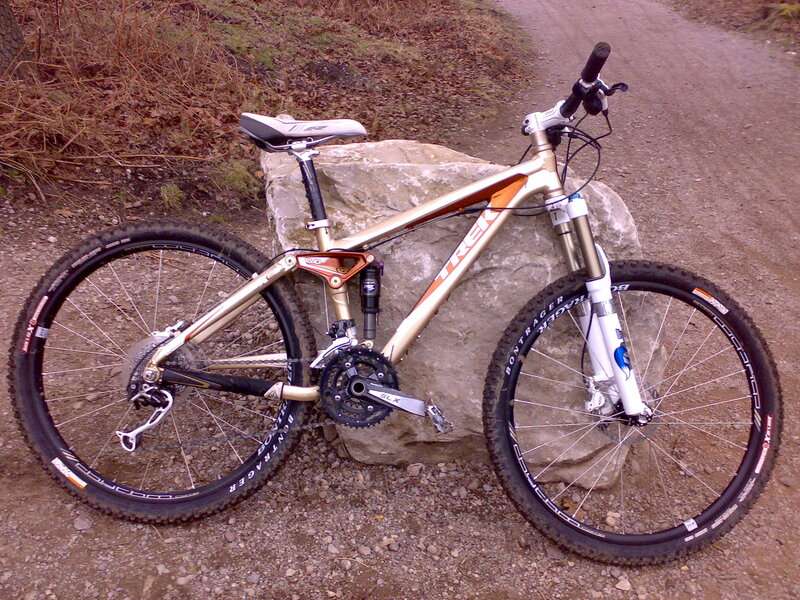 Next up was the Trek Fuel 8 WSD, which is infamously brown. Well, to be fair, it’s actually more like bronze and gold in the flesh, but that’s still dangerously close to brown in my book. The Trek, sadly, disappointed slightly, but I feel that was more down to the set-up rather than being down to the bike itself. The gears were a bit crunchy, and the brakes kept rubbing, leading to a quiet ghostly wail as I rode, which transformed into what can only be described as the honking of an angry goose when I actually applied the brakes. The brakes also felt a little spongey, with the lever needing to be pulled back to its full extent to get any bite. On the plus side, noisy brakes are awesome for startling nearby walkers…. Geometry wasn’t too bad, but I think I would have benefitted going to the 15.5″ instead of the 14.5″ – despite having the same top tube length as its male counterparts, the bike I was on still felt a little short. 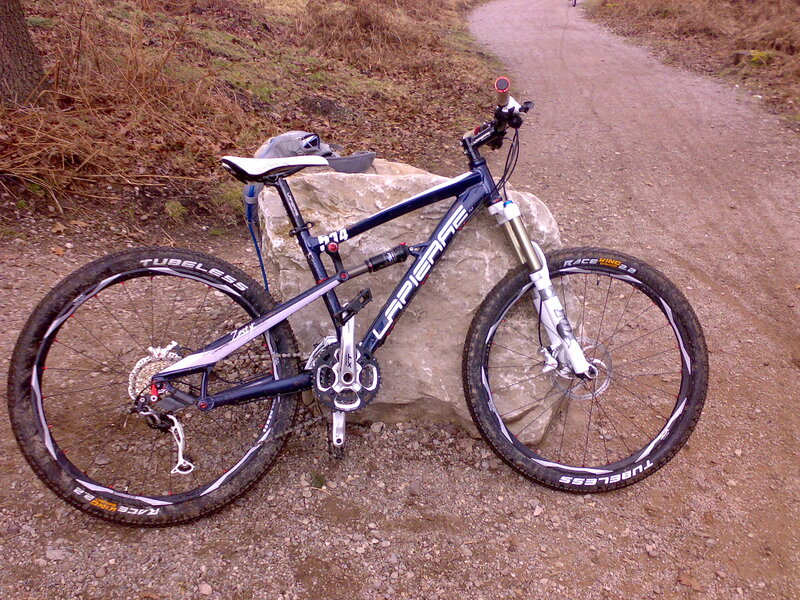 Again, like the Safire, I’m not going to completely write off the Trek until I’ve given it a fair chance. Despite the problems, it was still an enjoyable ride, and all of those problems aren’t inherent to the bike itself. Brakes can be bled and discs adjusted, gears can be cleaned and oiled. It’s just a shame that the bike wasn’t at its best on the demo day – which is possibly the one day it really needs to be! I think I’ll try and demo the next size up from Swinnertons at some point, and see if it impresses then. The Juliana was a nice ride, again, solid and stable. I felt confident enough to take her down Section 13, which I haven’t ridden since…*checks previous blog entries*…August! Unfortuantely, I don’t think it was quite what I was after – it was a really nice bike, and I’d be happy to take one out for a more extended spin, but it felt slightly off (but annoyingly not in any way I can quite explain), and it didn’t tackle climbs with the same…er, zest as the Zesty. I never got to try the Yeti, but the guy at the tent told me that Yetis “come up large”, and that the small would be too big for me. Apparently they’ve just started making extra small 575s, but they have none in the demo fleet sadly. Still, have a picture of a Yeti anyway. Had my first demo day of the year yesterday…and my first ride since my knee operation in September! Even though the track was knackered and the weather was iffy, it was great to be back out again! It was the MBR Demo Day, with Specialized and Giant in attendance. It wasn’t quite as big an affair as last year, and wasn’t quite as well organised. We got there about 1.45pm, and headed straight to the Specialized tent. I wanted to give the Safire another go – ideally, I would have like to have tried sitting on both the small and the medium, but unfortunately bikes were going out as soon as they came in, so I stuck to the small. The Specialized chaps checked the details – apparently the small Safire had gone out an hour beforehand, so was due back immediately. “Come back at 2.10pm, we should have it ready by then”. Can you guess what happened, dear readers? If you recall last year’s demo day post, you probably can. The bike wasn’t back by 2.10pm. Or 2.30pm. No, the bike came back in at 2.50pm – more than an hour after it was due back. A new record! Anyway, onto the bike! I have to say, Specialized staff continue to impress – despite the miserable weather and fraying tempers due to late returns, they were friendly, informative, and dedicated to making sure that every single person who went out got the best experience possible. They adjusted the shock and the forks according to people’s weight, made sure everything was tightened up and the optimum height, and explained what kind of travel you should be looking for. Unfortunately, the bike impressed slightly less. Really nice rolling on the flat, lovely smooth gearing…but I just felt a bit perilous on descents. It felt a bit too short, a bit too upright – all in all, it felt like I was perched over the handlebars. I don’t know if it’s the case that I needed to go a size up, or just need a bike with a bit more reach, but it just didn’t feel right. 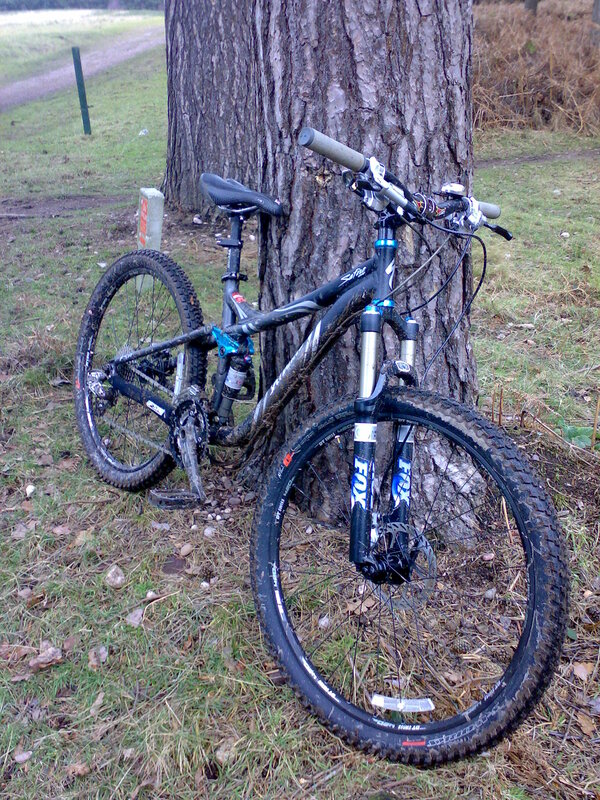 That said, it was my first time on a bike in five months, I was riding with the saddle far higher than I would normally (ie a sensible height, as dictated by my consultant), and it was very, very muddy (Yay! Slidey!) . It might just be that I need to give the Safire more of a chance and get used to biking again – especially on a different bike. When I returned the bike (ON TIME), the Specialized chap asked me how I got on. I was honest, and he had several suggestions. He didn’t think that I should go a size up, as that’d be too big height-wise, but I could increase the reach by moving the saddle back – it was as far forward as it would go. Might have to see if I can demo one from the concept store in Brum and give it a go when the weather’s better and I’ve got my confidence up again. Highlights: Being back on the bike for the first time since September!